The fire marshall said the blaze may have started with a spark on the third floor of the mall, which had a furniture section. AT LEAST 37 people, including call centre staff from an American firm, are believed to have perished in a fire that tore through a shopping mall in the southern Philippine city of Davao, local authorities have said. President Rodrigo Duterte, himself a Davao native, visited distraught relatives outside the burning building overnight but told them there was “zero” chance their loved ones had survived, witnesses told AFP. Fire crews found one body as the blaze was brought under control today, Davao Mayor Sara Duterte, the president’s daughter, told reporters. The deadly fire adds fresh misery for the mainly Catholic Philippines at Christmas as the death toll from a tropical storm that hit the south on Friday topped 200 and displaced tens of thousands of others. The blaze started at the four-storey NCCC Mall yesterday morning sending thick plumes of black smoke billowing into the sky over Davao. With low wages, but strong English language skills, the Philippines is a popular destination for international companies to set up customer call centres. The mall’s top floor housed a 24-hour call centre for US multinational SSI, a market research company. Jimmy Quimsing, a retired seaman, was one of the relatives desperately waiting for news. His 25-year-old son Jim Benedict worked at the call centre and had not been in contact since the fire broke out. Quimsing said he spoke to President Duterte and had been told to prepare for the worst. “He told us zero, no one would survive under these circumstances,” he told AFP. Duterte’s special assistant Christopher Go confirmed the bulk of the conversation to AFP. Paolo Duterte, the president’s son and the vice mayor of Davao, also wrote on Facebook that fire officials had told him there was “zero” chance of anyone trapped surviving the blaze. In a statement on its local Facebook page SSI Philippines Davao said it would set up a “command centre” for relatives of those missing. “Please continue to pray for everyone’s safety,” the firm added. Davao fire marshal Honeyfritz Alagano said the blaze may have started with a spark on the third floor of the mall, which had a furniture section. “One of our firemen here has a kid who is an (call centre) agent in there. He told us some of them went to collect their stuff at their lockers and were trapped,” Alagano told AFP. “The mall is an enclosed space with no ventilation. When our firemen tried to enter they were pushed back by smoke and fire,” she said. Deadly blazes occur regularly in the Philippines, particularly in slum areas where there are virtually no fire safety standards. 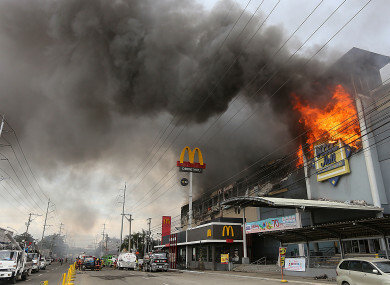 “It’s possible that while they were working, they did not immediately notice the fire spreading,” Davao police officer Ralph Canoy told AFP, referring to the call centre workers. Davao, with a population of about 1.5 million people, is the biggest city in the southern Philippines. It is about 1,000 kilometres south of Manila, the nation’s capital. The president served as mayor for more than two decades and continues to go home there on weekends from his work at the presidential palace in Manila. His daughter succeeded him as he ran for president, with one of his sons also winning the vice mayoralty post. Most of those killed by the recent tropical storm were also in the southern region of Mindanao. There have also been horrific fires in bigger buildings and factories, where corruption and exploitation mean supposedly strict standards are often not enforced. Seventy-two people were killed in 2015 when a fire tore through a footwear factory in Manila. Survivors of that blaze blamed barred windows and other sweatshop conditions for trapping people inside the factory. In the deadliest fire in the Philippines in recent times, 162 people were killed in a huge blaze that gutted a Manila disco in 1996. Email “At least 37 dead in fire at Philippines shopping centre ”. Feedback on “At least 37 dead in fire at Philippines shopping centre ”.